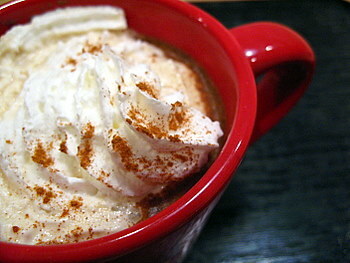 Spicy gingerbread lattes are a coffee shop favorite around the holidays. Most are made with a gingerbread-flavored syrup, but I find that you don’t get quite as good results as you do at the coffee shop even when you use the same brand of syrup at home. I prefer to make my Homemade Gingerbread Lattes using ingredients that are actually found in real gingerbread instead of some artificially flavored syrup. The results are more gingerbread-y and much tastier. This gingerbread latte starts, of course, with strongly brewed coffee. You can use espresso if you have an espresso machine. I lightly sweeten the coffee and stir in molasses, along with a pinch of cinnamon, cloves, ginger and nutmeg. Go easy on the spices, as in a small cup of coffee they will add a lot of aroma and flavor. Top off the coffee with hot or steamed milk, as well as some whipped cream, and you’re ready to serve. The drink can be sweetened to taste or with more molasses, for a stronger flavor, but it is definitely a holiday in a mug. Combine coffee, sugar, molasses and spices in a coffee mug and stir vigorously to combine, making sure the molasses has dissolved. Top off the coffee with hot or steamed milk. Finish with whipped cream and a sprinkle of additional spice for garnish. Serves one. Increase all amounts slightly for a larger cup size. Recipe can be scaled up as needed to accommodate more people. I originally featured this recipe on Baking Bites!